Britain's world heavyweight champion Anthony Joshua could fight Wladimir Klitschko at Wembley Stadium in April. Joshua, 27, defends his IBF title against American Eric Molina in Manchester on Saturday. If he wins that fight it will pave the way for him to face Ukrainian Klitschko, 40, for the WBA and IBF titles in a unification bout next year. 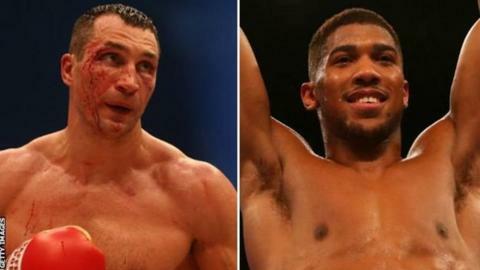 "Wembley is a front runner for Joshua-Klitschko - but it isn't secured," said boxing promoter Eddie Hearn. "All being well, 29 April could be the date." However, Joshua said: "I still have Molina in front of me. "I have to keep myself on the rise. You know how it goes with people - one bad performance and they say 'you'll never beat that guy'. "I'm the guy that should beat Klitschko, so I have to make sure I perform like the guy who should beat Klitschko. Even though I'm not fighting him on Saturday, I have to look good." Joshua and Klitschko had been close to agreeing a bout for 10 December but Klitschko picked up a "minor injury" in training. The Ukrainian, who has 64 wins and four losses in his career, lost the WBA, WBO and IBF titles to British heavyweight Tyson Fury in November 2015. Joshua has 17 wins from 17 fights and picked up the IBF title - vacated by Fury as he did not face a mandatory challenger - by knocking out Charles Martin in April. Hearn said Joshua is "approaching the crunch time of this career", adding: "This is Joshua's 18th fight so he's allowed to have a couple more before big fights like Klitschko. "Wladimir has a lot of experience so Anthony's at a disadvantage in that respect, but what works in his favour is he is very fresh. He's ready for these fights and he wants them. "Once we get Molina out of the way on Saturday, we will be in super fights from then onwards."